Apart form this intriguing plot, which of course will interest those obsessed with the space race and the Soviet Union, the most interesting part of this project, which started in 2009 in Spain, is the way it has been produced, the way it will be distributed and the different narratives created around the film. Three words define their strategy: transmedia, crowdfunding and creative commons. The Cosmonaut has achieved over 400.000€ through crowdfunding. Those who have collaborated to produce this film receive periodic news about it and special content and materials –at least 32 additional episodes, related with the movie–, before it is released to the general public, who also will have access to this transmedia experience. Moreover, next May 18th the film will be distributed through the Internet for free at the same time as DVD, TV and cinema. Furthermore, The Cosmonaut will be available under a Creative Commons license, which means that everybody can copy, remix and distribute the film. 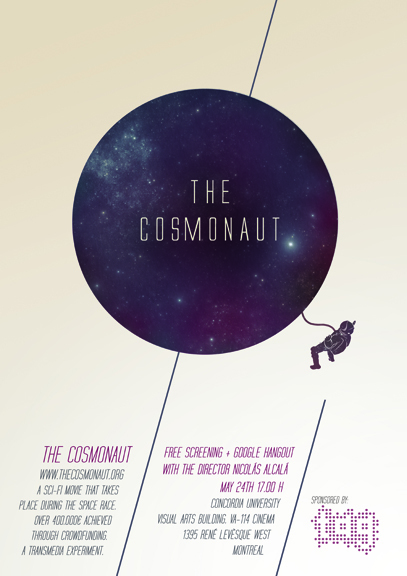 Next May 24th, The Cosmonaut will be screened at Concordia. After the screening, we have organized a Google Hangout with the director Nicolás Alcalá who will answer the questions of those interested in following his steps or are curious about the project.